It is July 20, 1969, about 5 p.m. Houston time. Less than two hours before, the LM had separated from the command and service module as the two flew in similar, safe orbits around the moon, preparing for the critical descent. Then the LM initiated its DOI burn, for ''descent orbit insertion'' around the far side of the moon, to bring Neil Armstrong and Buzz Aldrin down from a circular sixty-mile orbit to an elliptical one, sixty by ten miles. The crew carefully monitored the burn—ready to cut it off manually if necessary, to abort if it burned even slightly longer than planned. Michael Collins, in the CSM Columbia, was also watching, tracking by radio his range to the LM. Everything was multiple, redundant, ''man rated.'' At every turn, the astronauts were ''in the loop.'' From the alignment of the inertial platform to the PRO button, the final check was to be executed by the people with the most to lose. The burn went well. The first report of success heard on the ground was not from the LM but from Collins, alone in the CSM, as he emerged first from behind the moon: ''Listen, babe. Everything's going just swimmingly. Beautiful.'' A few minutes later, the LM, nicknamed Eagle, emerged as well, also reporting the successful burn. 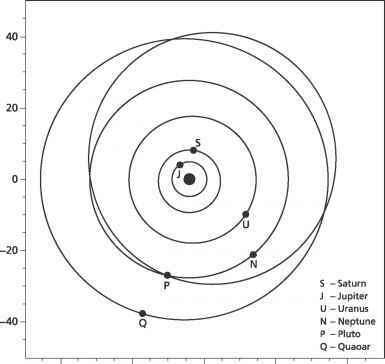 Now the comparatively pure orbital mechanics would begin to intersect the uncertainties and roughness of the moon. At first Armstrong and Aldrin came in facing down, feet first. This being the first time, they wanted to doublecheck the safety factors by eye. As their elliptical orbit carried them close to the surface, Armstrong and Aldrin sighted landmarks on the ground and timed how long it took them to pass across their window—in tandem with paper charts, these observations provided a way to measure altitude. The check indicated a perilune of about 53,000 feet over the moon's surface. 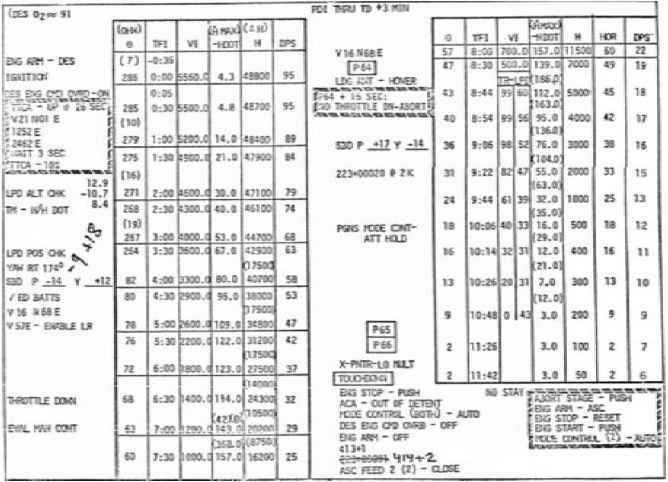 From the CSM, Collins's range to the LM allowed the computer to calculate an independent altitude, which indicated about 50,000 feet, while the PNGS indicated 49,971 feet (later calculations showed true altitude at 51,000 feet). Close enough for confidence. Houston began having problems receiving signals from the LM's high-gain antenna, problems that would continue throughout the coming descent. The antenna provided high-bandwidth: clear voices and many bits of data—but it had to point straight at earth to work. A servo that directed the antenna was having trouble tracking the earth, because in the face-down position it was obstructed by another part of the spacecraft's structure (also its radio transmissions were likely bouncing off the moon, creating an interfering signal). Houston asked the crew to move, to allow a clearer path for better data, in effect asking the human operators to compensate for a problem in the automatic servo: ''Eagle, Houston. We recommend you yaw 10 [degrees] right. It will help us on the high gain signal strength. Over.'' They accomplished the yaw, although at some cost to their view out the window. A few minutes later: ''Eagle, Houston. If you read, you're GO for powered descent. Over,'' drawled Capsule Communicator (CAPCOM) Charlie Duke (the astronaut on the ground who communicated with the astronauts on board), in his smooth, Southern accent. Aldrin keyed in Verb 37 Noun 63, enabling program P63 for powered descent. In a few minutes the computer would run the subroutine BURNBABY, which calculated and controlled the descent engine firing to begin guiding the LM toward the moon's surface. Verb 06 Noun 62 appeared on the DSKY, and the second display row began counting down to the burn. When it was almost time, the display flashed. The computer would not light the engine until Aldrin pressed PRO. He promptly hit the button, giving his human okay to the automatic firing (figure 9.1). The engine came up to 10 percent thrust, barely noticeable, allowing the descent engine to trim its gimbals so its thrust would go right through the LM's center of gravity. About thirty seconds later, the engine throttled up to nearly full, to begin slowing the LM out of orbit. As Aldrin calmly ran through his checklists, Houston was fussing with the telemetry, asking the LM crew to switch antennas and to jimmy the tracking modes. Aldrin's main job was to monitor the two guidance systems, AGS and PNGS, to make sure they agreed. He stared at two sets of numerical displays, comparing them in his head, and would call out if there was a problem. A simple enough job for a Ph.D. from MIT, yet Aldrin remembered his intensity: ''There's a focusing of an individual's concentration and level of attention that is at the exclusion of a lot of other things. It's a kind of gun-barrel vision.'' He still had a great deal of trouble aligning the antennas and was trying to track the earth manually.